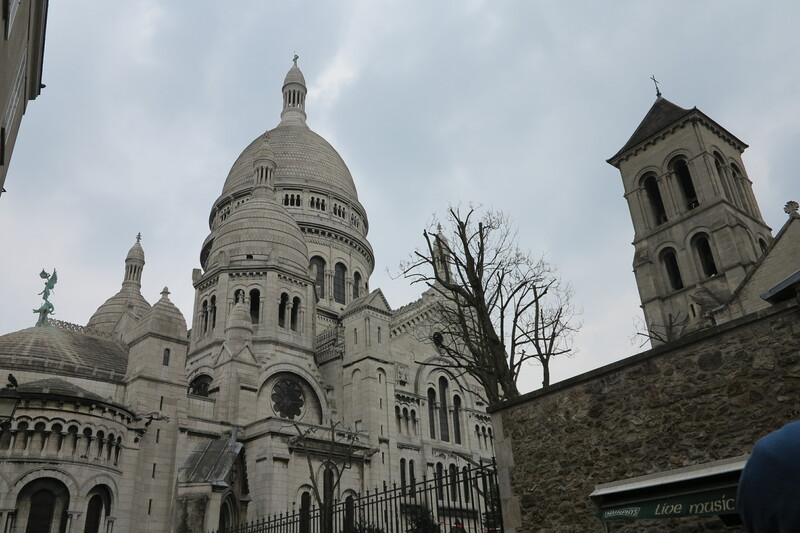 Starting out this week with a few shots of my recent trip to Paris. I have been working there quite a bit lately and decided that it was time to stay over a weekend and have some fun. 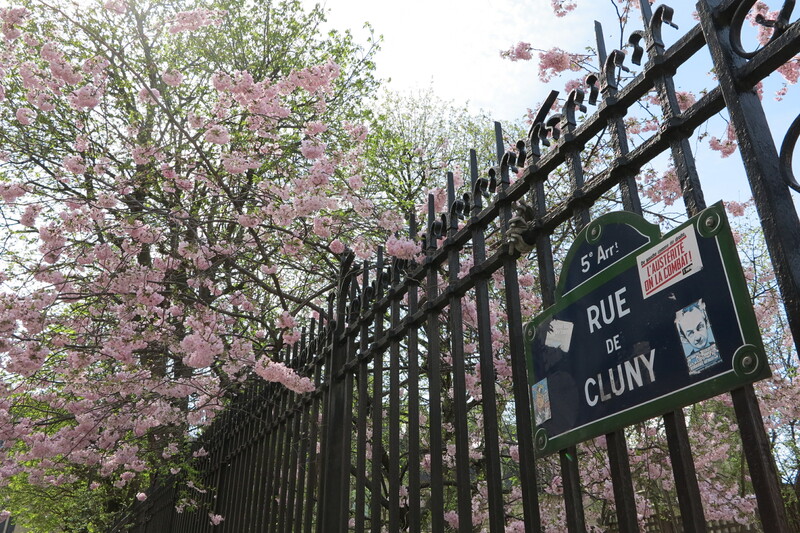 My husband (the eclair fiend) stopped by and the weather played along nicely. 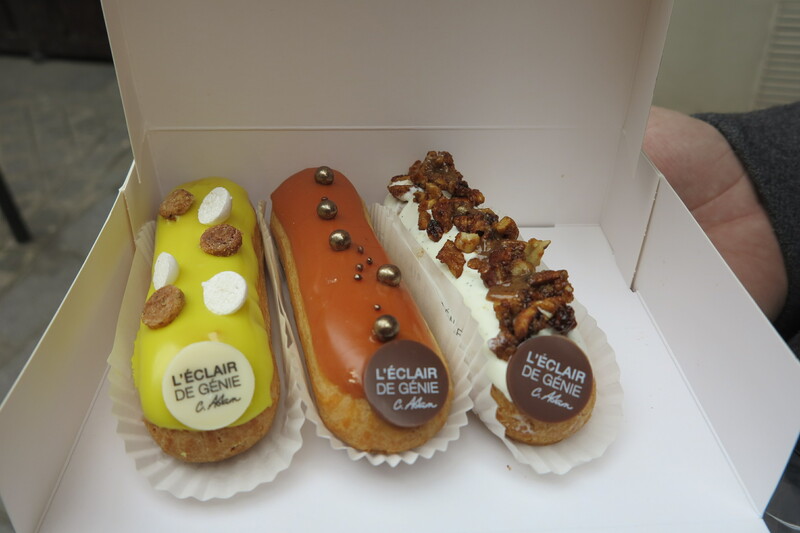 After much sampling, the eclair fiend decided that the offerings from L’eclaire de Genie in the Marais were the best. I can only agree. So, what was I supposed to be talking about? I can’t seem to drag my mind away from the eclairs. French Fridays with Dorie? Oh, right, this week’s recipe, Swiss Chard Pancakes. With the spring veggies finally starting to make an appearance (and it’s about darn time!) it was actually not so easy to find chard. My regular product market didn’t have, but I did finally find some lonely bunches hidden at the far back of my local grocery store. They looked ok when I bought them, but by the next day they had seriously wilted and were not so pretty looking. From the two bunches I bought, I was only able to salvage enough leaves for half a batch of Dorie’s pancakes. Making the pancakes was easy as could be. Just throw all of the ingredients into the blender and blitz. The color of the batter was St. Patrick’s Day green and had me thinking that these might have fit better in the March schedule. 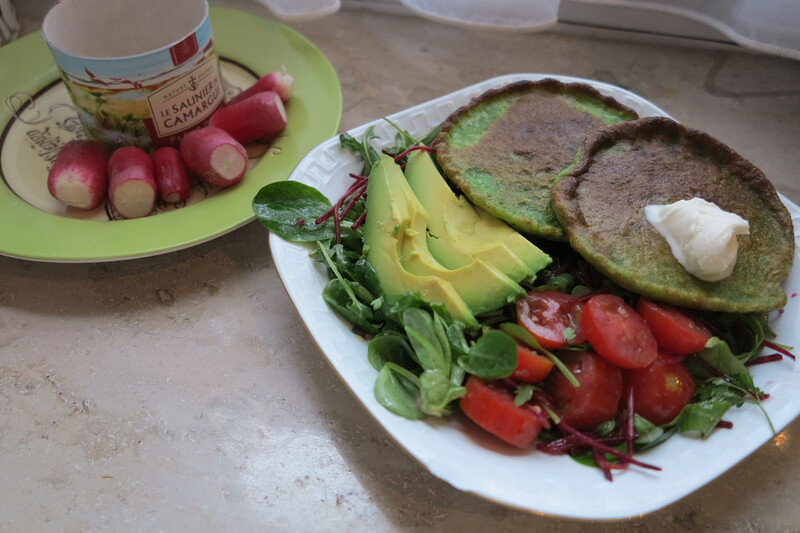 I fried up my pancakes and served them with a fresh salad and a dollop of creme fraiche. All of which may sound very healthy, but my pancakes seemed to be awfully greasy, despite all the paper towels I went through trying to soak up the oil. Possibly I didn’t turn up the heat high enough. Whatever it was, these were sadly not a hit. 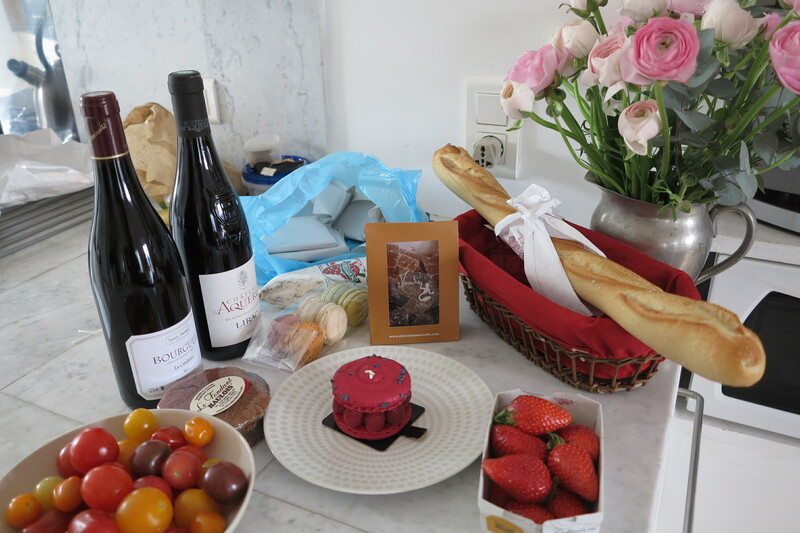 This entry was posted in french fridays with dorie, travel and tagged Around my French Table, salad, side dish, vegetarian. Bookmark the permalink. Looks amazing! 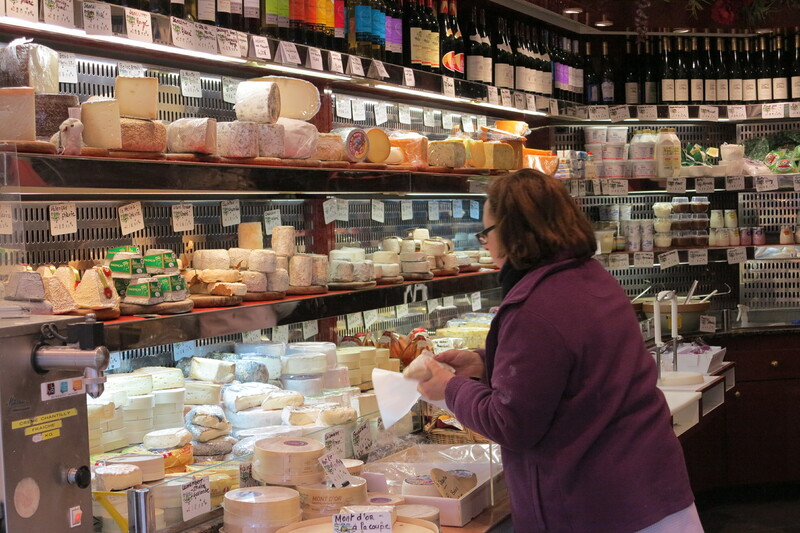 What I would do for that cheese selection. Thanks for the vicarious living :). They are such a vibrant color – too bad they didn’t work out better for you (I found I liked them better when I used less oil). They came out looking so nice – too bad they weren’t such a hit for you. I really cut back on the oil when I made them because I was so worried about them getting greasy. But, oh goodness, it’s definitely the pastries that rule this post! How very nice indeed! I used a lot less oil than called for and I think that made a difference. I’m sorry they weren’t a hit for you. It’s great that you got some weekend time in Paris. I had a friend who travelled for work and never got to experience anything in the cities she worked in except hotels and office towers. Oh man…those Eclairs look incredible! How lovely to spend a weekend in Paris with your husband. 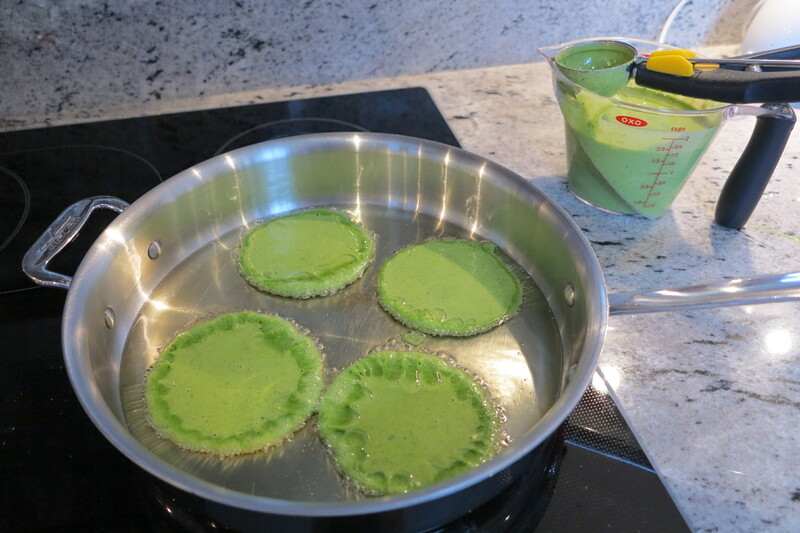 Love the gorgeous color of your pancakes…sorry they weren’t a hit! Wow… I keep thinking about the eclairs too… I used less oil than Dorie said and a cast iron pan that was pretty hot so my pancakes didn’t absorb much oil. Yum – éclairs 🙂 Looks like a fun weekend. Sorry your pancakes didn’t turn out for you – I didn’t use much oil and they were fine. Yours are so GREEN!! Thumbs up to the eclairs! Agree with the oilyness of the pancakes. These pancakes were just that exciting. Yes, we could have written each other’s posts this week, except for the part about Paris. Looks like you had a great weekend! Now, Rosa, it’s pretty difficult posting Parisian eclairs and swiss chard pancakes in the same Post and expecting the pancakes to gain any traction at all. Seriously? I liked the pancakes and will make them again using the ideas from other FFWD Posts. I went easy on the grapeseed oil and will use even less next time. I must say that your photo of the finished product looks delicious. Beautiful. I have written down your husband’s fave Pâtisserie in the Marais. I think we’re in the minority this week. I’m hoping next week’s recipe will be better. 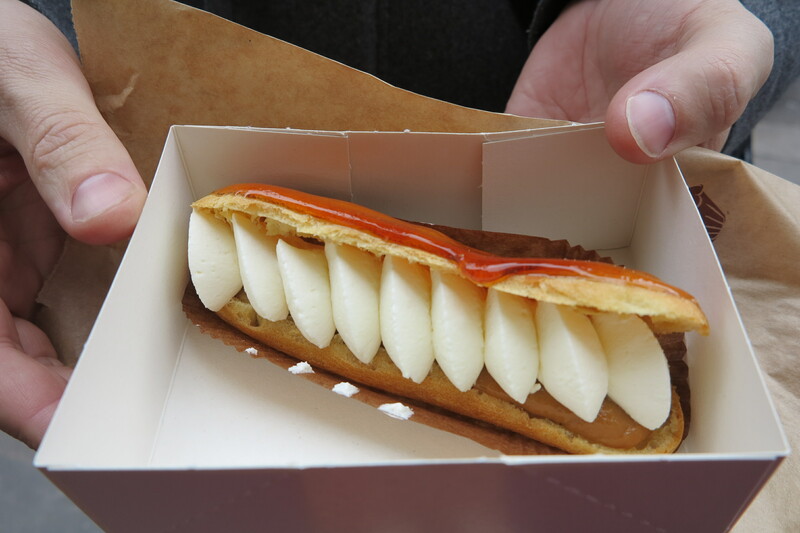 You’ve now made me really hungry for an eclair! They look delicious.